Do you like building stuff? Do you like MIDI controllers? Then Livid Instruments' new Builder Box kits could be for you. The idea is simple: you order a Builder Box, use the bits that it contains to construct your controller, then start using it. 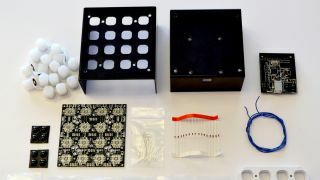 Step-by-step guidance is included, so even a beginner should be able to live out their dream of becoming a boutique hardware creator. You can currently choose from Button and Fader Boxes (the former comprises a 16-button grid; the latter is a bank of four faders), each of which is currently available at the introductory price of $99. Completed controllers are plug-n-play MIDI devices and you can choose to make controller assignments manually or use Livid's free software templates. Orders can be placed on the Livid Instruments website.